For the Harvard University historian, see William L. Langer. For the Wisconsin politician, see William Langer (Wisconsin politician). William "Wild Bill" Langer (September 30, 1886 – November 8, 1959) was a prominent US lawyer and politician from North Dakota. Langer is one of the most colorful characters in North Dakota history, most famously bouncing back from a scandal that forced him out of the governor's office and into multiple trials. He served as the 17th and 21st Governor of North Dakota from 1932 to 1934 and from 1937 to 1939. Langer served in the United States Senate from 1941 until his death in office in 1959. As senator he was best known for strongly opposing any American military involvement in world affairs, while his opponents called him an isolationist. Langer was born on September 30, 1886 near Casselton, Dakota Territory, to German Americans Frank and Mary (Weber) Langer. His Catholic father, Frank Langer, was a member of the first legislature of the state of North Dakota. William, who spoke German fluently, was valedictorian of Casselton High School upon graduation in 1904. He obtained a bachelor of laws from the University of North Dakota in Grand Forks, but was too young upon graduation to practice law. He therefore continued his undergraduate education at Columbia, where he graduated at the top of his class in 1910. Although he was offered a position at a prominent New York law firm, he elected to return to North Dakota, where he practiced law in the town of Mandan before starting his career in politics. He married Lydia Cady, the daughter of New York architect J. Cleaveland Cady, in 1918, and had four daughters, Emma, Lydia, Mary, and Cornelia (who became a wife of abstract painter Kenneth Noland). In 1914, Langer was appointed state's attorney of Morton County and was one of a few non-farmers on the Nonpartisan League Republican 1916 state ticket. He was elected state attorney general as the newly formed NPL party swept to victory in the 1916 election, but soon clashed with the party's founder and mercurial leader Arthur C. Townley. By 1920, Langer was publicly accusing Townley of Bolshevism, and failed in a primary campaign to replace the incumbent NPL governor Lynn Frazier as the party's gubernatorial candidate. Langer's break with the NPL leadership was a reflection of the infighting that limited the party's eventual influence on North Dakota politics. Langer eventually mended his rift with the NPL and was elected governor of North Dakota in 1932. 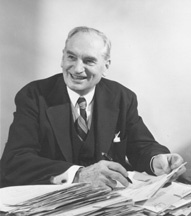 As governor, Langer in 1933 required all state employees to donate part of their annual salaries to the NPL and to the Leader, a weekly newspaper owned by high-ranking officials in his administration. Collecting this money was not prohibited by state law and was a common, traditional practice. However, when donations were made by highway department employees, who were paid through federal relief programs, the U.S. District Attorney for North Dakota, P. W. Lanier, charged that the donations constituted a conspiracy to defraud the federal government. Brought to trial in 1934, Langer and five co-conspirators were found guilty. The trial was presided over by Judge Andrew Miller and was prosecuted by U.S. Attorney Lanier, two of Langer's strongest political opponents in the state. The first trial was littered with procedural errors which made it invalid on appeal, including improper and rigged jury selection (the jurors were alleged to have had personal bias against Langer and hand-picked by the prosecutor) and heavily biased and opinionated jury instructions. Because of the felony conviction, the North Dakota Supreme Court ordered him removed from office, and on July 17, 1934, the Court declared Lieutenant Governor Ole H. Olson the legitimate governor. Langer gathered with about ten friends, declared North Dakota independent, declared martial law, and barricaded himself in the governor's mansion until the Supreme Court would meet with him. Langer eventually relented, and Olson served the remainder of Langer's term as governor. In 1935 the convictions were overturned on appeal. The case against Langer was retried twice in 1935. Judge Miller, following a recusal motion by Langer, refused to step down as judge in the first retrial, which resulted in a hung jury. In between the second and third trials, U.S. Attorney Lanier filed charges against Langer for committing perjury in his recusal motion against Judge Miller. This trial, unprecedented in its nature on perjury in an affidavit requesting a recusal, resulted in a directed verdict to acquit Langer. The second retrial of the original charges, finally presided over by a judge other than Miller resulted in Langer's acquittal. Throughout all of the trials, Langer maintained that he was innocent and was the victim of a political vendetta from Judge Miller and U.S. Attorney Lanier, and was returned to the governorship in the 1936 election. Historian Lawrence Larsen calls him "a master of "political theater." Langer's wife, Lydia, ran for governor in 1934 but lost. In 1938 Langer ran for the Senate as an independent, and received 42% of the vote; he was defeated by Republican Gerald Nye. The 1940 election was another very dramatic one. Langer defeated incumbent Lynn Frazier in the Republican primary, and then faced both the Democratic candidate, Charles Vogel, and Republican/NPL Congressman William Lemke, who declined to run for reelection to Congress in order to run for the Senate as an independent. Langer won the election with 38% of the vote. Because of the trials mentioned above, Langer's qualifications were questioned under Article 1, Section 5 of the Constitution, which declares the U.S. Senate to be the ultimate judge of the elections, qualifications, and returns of its members. The Senate seated Langer conditionally and then began an investigation into his trials. The Committee on Privileges and Elections found Langer guilty of "moral turpitude" and was judged unqualified to be a U.S. senator. The full Senate reversed the committee, and voted to seat Langer. Biographer Glenn H. Smith says his Senate career was "A Study in Isolationism, 1940–1959" and emphasizes his close ties with German American and Scandinavian American voters who bitterly remembered the First World War in the Dakotas and deeply distrusted Britain and the United Nations. Langer, like Senator Henrik Shipstead of Minnesota, championed non-interventionism and supported minimizing America's involvement in World War II. At home, he concentrated on making life easier for the farmers of North Dakota by raising wheat prices and granting government relief, although amidst rumors of great scandal. He was also very adamant about implementing affordable healthcare for everyone. As a senator, he served on the Post Office, Civil Service and Indian Affairs committees. He and Shipstead were the only senators to vote against the United Nations Charter in 1945. He was also one of the seven senators who opposed full United States entry into the United Nations. In September 1950, Langer filibustered to prevent the override of President Truman's veto of the McCarran Internal Security Act, for five hours, before collapsing. In 1951 he lobbied John J. McCloy, the U.S. High Commissioner for Germany to grant a reprieve to Martin Sandberger, a high ranking SS official who had been convicted of crimes against humanity and war crimes for his role in the mass murder of Jews and others in Estonia during the Holocaust. Although sentenced to die by the tribunal of the Einsatzgruppen trial, in no small part due to Langer's lobbying, Sandberger's sentence was commuted and he ultimately served only six years in prison. Following the merger of the Nonpartisan League with the state Democratic party, Langer remained on the Republican ticket in the 1958 Senate elections, and won without making a single campaign appearance in the state. Langer died in Washington, D.C. on November 8, 1959. He was the last U.S. Senator to lie in state in the Senate Chamber until Robert Byrd of West Virginia more than 50 years later, in 2010. The Famine in Germany. Washington, DC: US Government Printing Office, 1946. ^ "Attorney General of North Dakota weds New York Girl". Chicago Daily Tribune. February 27, 1918. ^ a b c d Vogel, Robert (2004). Unequal Contest: Bill Langer and His Political Enemies. Mandan, ND: Crain Grosinger Publishing. ISBN 0-9720054-3-9. ^ "Footnotes to History- N and O". Archived from the original on December 14, 2005. Retrieved December 13, 2005. ^ "UNO Bill Approved By Senate, 65 to 7, With One Change". The New York Times. December 4, 1945. Retrieved December 27, 2016. ^ a b Brenda Gayle Plummer (1996). Rising Wind: Black Americans and U.S. Foreign Affairs, 1935–1960. Chapel Hill, North Carolina: University of North Carolina Press. p. 109. ^ Griffith, Robert (1970). The Politics of Fear: Joseph R. McCarthy and the Senate. Lexington: University Press of Kentucky. p. 121. ^ Frei, Norbert, and Golb, Joel, "Adenauer's Germany and the Nazi past", at pages 226 to 229. Holzworth, John M. The Fighting Governor: The Story of William Langer and the State of North Dakota. Chicago: The Pointer Press, 1938. Smith, Glenn H. Langer of North Dakota: A Study in Isolationism, 1940–1959. New York: Garland Publishers, 1979. Smith, Glenn H. "William Langer," in Thomas W. Howard, ed. The North Dakota Political Tradition. Ames, IA: Iowa State University Press, 1981. Tweton, D. Jerome. "The Politics of Chaos: North Dakota in the 1930s," Journal of the West, Fall 2002, vol. 41, no. 4, pp. 30–35. This page was last edited on 12 April 2019, at 00:16 (UTC).